After 15 years of working in the human services field, Professor Mary Handley decided to go into teaching where she would have the opportunity to guide students to become leaders in the field of human services. 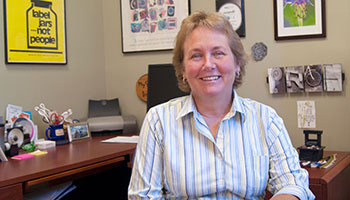 Since coming to Cazenovia College in 1999, Dr. Handley has continued to work toward her goal of educating students on the topic areas involved in human services and showing them they can have a large influence on others through their careers. "The best thing about my job is working with students. Absolutely, hands-down, the students make teaching enjoyable!" comments Handley. For the past 20 years, Handley has taught various courses at Cazenovia College, including: Introduction to Human Services, Rehabilitation Services, Therapeutic Recreation, Introduction to Mental Health, Senior Capstone, and other human service classes. Handley guides and facilitates her students' learning experience, providing them with the information they need to be successful in the field of human services. "My teaching philosophy is to teach students about improving the quality of life for people in need so they can then take the next step to working with people and making a difference in their lives," adds Handley. When asked how she thought her students would describe her, Handley responded with one word, passionate. "You can't get out of one of my classes without feeling passion for people in need, or people with disabilities!" adds Handley. Handley has received numerous awards over her time teaching at Cazenovia College. In 2004, she worked on a series with WCNY called "My So-Called Disability" and won an award for the series. Over the two years the series aired, eight episodes highlighted different disabilities. 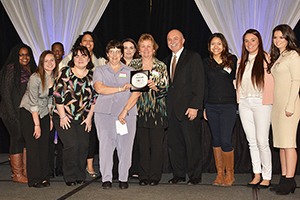 More recently, Handley received an award for the inclusion program she developed at Cazenovia College. Last year, she was honored with an award from Access CNY for the inclusion of young adults with disabilities from the community. Handley is very proud of the Inclusion Program, which is a program where students work with young adults with disabilities. The campus comes together to interact with the adults who visit campus during the day. Human service students also serve as mentors to the adults in the program, and work with them on different projects. "Every year they have a kickball game on the Quad," adds Handley. "Everyone is out on the Quad – students and adults with disabilities – playing kickball together." Beyond the classroom, Handley runs her own practice where she continues to help people in need in the community. Through her experiences, she is able to bring new information from her experiences into the classroom. A special part of teaching at Cazenovia College is being able to advise students. Faculty meet regularly with students to advise them on the courses they need to take, and much more. Students change careers and ideas as they learn and grow, so the advisor's role is also to mentor students and help them create a path where they gain the skills they need for future success. Handley comments, "I feel like mentoring really makes the difference for a many students' educational career. They have the course work, and then the mentoring kind of fills the gaps." As a professor Handley recalls many ah-ha moments with students. One moment in particular was when a student came back from an internship site and told her she wanted to change her career path. This student noticed during her internship there was a need for more psychiatrists who work with children, so that is exactly what she wanted to do. As a result of this experience, she went on to medical school to become a psychiatrist and is graduating in May 2017. It was a moment for both Handley and the student to reflect on the human services field overall. This student graduated from Cazenovia College and continued to medical school to pursue her dream. "There are many moments during student internships where I am really proud of them and how they have stepped up to the plate," Handley reminisces. "I had a student out on a home visit and they saw a family with lots of needs. That student came back and said she really wanted to help that family. She followed up and found the resources to improve their lives." Handley's passion for helping others definitely rubs off on her student, as they are always the first ones willing to volunteer and help the community. "What I like most about teaching today's student is that if we have a question we can look it up right away. You can get an answer to any question pretty quickly," says Handley. Today's technology allows us to discuss current events or crises happening around the world. Students have immediate access search the internet to find out what is happening in another area of the world and create a plan of action based on that information. It gives the students the opportunity to help anyone, anywhere. As the advisor of the Human Services Club, Handley helps students with fundraising, awareness trainings, volunteer projects, and social gatherings. Every year the club participates in the Breast Cancer walk in Syracuse and hosts the Take Back the Night event at Cazenovia College. She takes the students to the Rescue Mission and CazCares to volunteer, as well as adopt a family every year during the holidays. Handley is also the advisor for the Tau Upsilon Alpha Honor Society - a national honor society for human services students who excel academically. Students inducted into TUA are required to serve in the community and be dedicated to the field. "Parents should know that their son or daughter will gain knowledge and experience that will be useful to them after they graduate," reassures Handley. The Human Service students are always going out into the community to volunteer, bringing motivational speakers to campus, and gaining hands-on experience in the field. Handley is proud to say her students graduate with a broad range of learning experiences that will help them be successful in their chosen career paths. Learn more about Dr. Handley through our Faculty Spotlight video.